Mastigias papua. Photo courtesy of Vancouver Aquarium. A new exhibition opened this week at the Vancouver Aquarium, running through November 12, 2013. Simply called Jelly Invasion, the jellies number in the thousands, including more than 15 species of jellies from around the world -- each corner of the Aquarium will showcase a different species. They're mesmerizing to watch, so it's no surprise the Vancouver Aquarium Jelly Cam is getting plenty of traffic. Growing up in the Pacific Northwest, we called them jellyfish, and had fights on the beach with the white ones (the red ones we feared most, as they could sting). 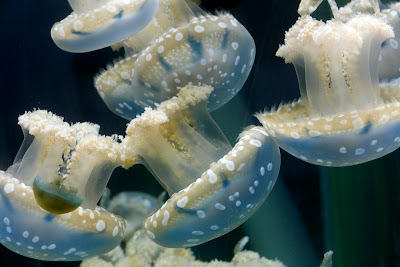 And it's true that some box jellyfishes can cause cardiac arrests in humans within minutes of being stung. 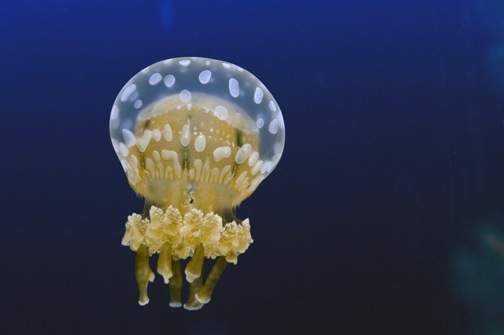 The term jellies refer to all gelatinous drifting animals (zooplankton), while jellyfish is used to describe the umbrella-shaped jellies with stinging cells that belong to the group of animals (phylum) called Cnidaria. 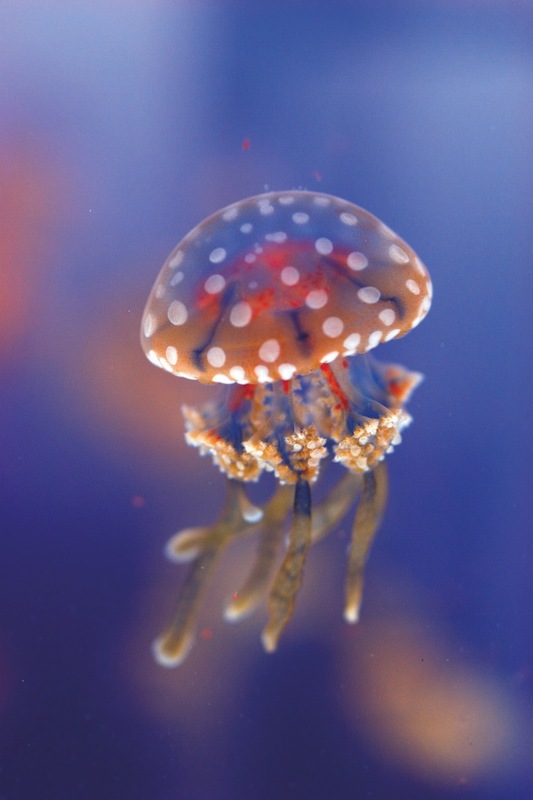 Jelly Neil Fisher. Vancouver Aquarium photo. Highlights of the exhibit include such jellies as the lion's mane, a jellyfish whose tentacles can grow to the length of five city buses parked end to end (60 meters long); the upside-down jellyfish, which care for the algae growing in their tissues by always flipping upside down; the blubber and spotted jellyfishes from the warm waters of the Indo-Pacific that have no tentacles, but still sting; and the translucent comb jelly, a fierce predator of other comb jellies found in the cooler waters of the Pacific Northwest. Spotted Jell. Photo courtesy of Vancouver Aquarium.